1A. Junior Championship for Formula 125, Ninja 300 and restricted 450cc Aprilia max age 18 years. 5. Formula 600 class including 750cc triples. 11. The Allcomers cup for 600cc and open class machines. 12a. Open sidecars for any sidecar to 1300cc four stroke and 750cc two stroke. This class will include the Triumph 675cc TT class. Membership and Entry Fees 2019. For 2019 everyone will pay a Membership Fee of £15.00. Entry Fees for 2019 will be £140.00 for the first Solo Class and £40.00 for additional classes, the newcomers handicap will cost £15.00. The Allcomers Cup will cost £25.00. For Sidecars the Entry Fee will be £160.00. The main reason for the increase in Entry Fees is because of increases in Insurances for the Circuit, the ACU and huge increases in local authority rates. Entries received after the closing date will be surcharged £20.00. Please note that for on-line entries the closing date will be one week later than for normal postal entries. A non - refundable deposit of £50.00 or the full Entry Fee must be enclosed with the Entry Form. Any Entry received without any payment will be returned. Practice and Races on Race Day. Each class will receive a timed Practice session of ten minutes. Each class will have two races of six or eight laps. Some classes may be combined for either practice or races. Grid positions for both races will be based on the result of the timed practice. REMEMBER – NO TRANSPONDER = NO TIMES = START FROM THE BACK OF THE GRID. Championship points 1st = 15, 2nd = 12, 3rd = 10, 4th= 8, 5th = 6, 6th = 5, 7th = 4, 8th = 3, 9th = 2, 10th = 1, will be scored in both races and all rounds will count. For the Stars at Darley meeting each class will have ONE race of 15 laps with DOUBLE Championship Points. The Club will have a supply of Tranx 260 transponders to hire at each meeting. The cost of hiring a transponder will be £15.00 per meeting. Darley is extremely noise sensitive and any machine that fails the noise test will NOT be permitted to start the meeting. ACU noise regulations are 105 Dba with no dispensations. PLEASE NOTE. For 2019 the ACU have an on-line Licence Application Form. You must add your unique number to the form instead of getting a Club Official’s Signature. That Unique number for Darley Members is also your Club Membership Number. For 2019 the unique number begins with 19082. This Unique Number must also be inserted on any traditional paper application for your ACU Licence. These will be sent out during the first two weeks of February and after that time will normally be sent with your Membership Card etc. Please look after your Membership Pack as a replacement pack will be charged at £10.00. 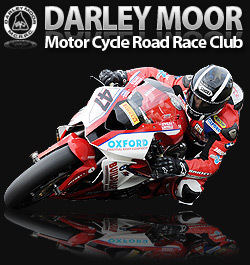 Visit the Darley Moor website at www.darleymoor.co.uk. To book your Race Entries on-line and for all the latest Darley Moor news and information. Have a safe and enjoyable season’s racing at Darley Moor. The onus of eligibility rests with the rider.